Turning the inessential into fortuitous originals just for you! Feel like you can't wear fun, comfortable clothes until you get home? Want to keep your sense of personal style and funky groove alive even when you leave the house? 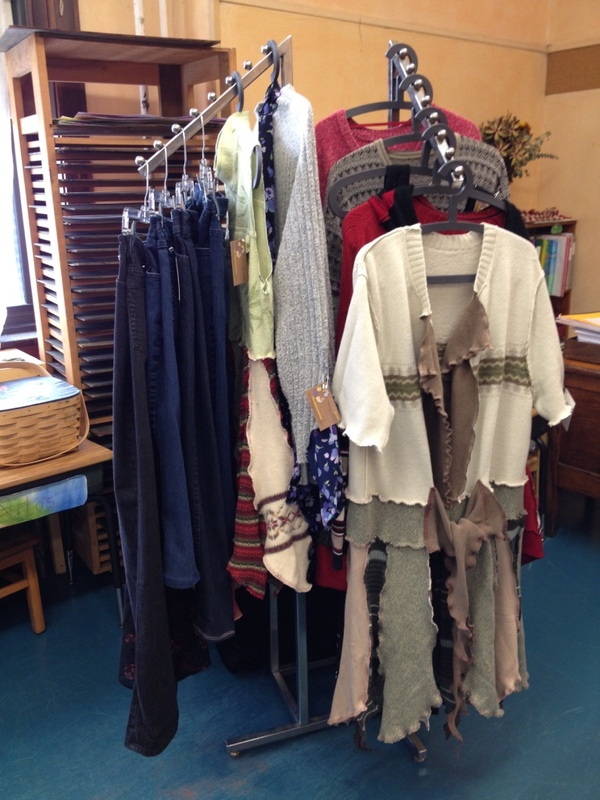 The Repurposement focuses on clothing perfect for work, family events, or evenings out. Take your fun factor with you where ever you go but wearing something as cool on the outside as you are on the inside. These, one of a kind, wearable art pieces have a corporate tribal feel that will fit in a variety of situations. Comfortable, work ready, and wearable just about anywhere, these up cycled and repurposed items can go with you from home, to the office, sales floor, coffee out with friends, and to a night out on the town. New use, New focus, New intention. I have learned over the years that the best thing about a great outfit is the person in it! Each article of clothing is completely unique and like no other. The material used to make these wearable art pieces are deconstructed, reworked, and woven together in such a way that they become something different. The unwanted and discarded items work together to become a new incarnation of their original selves. Find more information about what is currently on sale go to The Repuposement Facebook page. The unique and Wabi Sabi character of the clothing speaks to a individualistic sense of personal style. Shel, as the creatrix, starts out with a vision of what is to come and using the feel of the materials moves them towards their metamorphosis. There are times, when the pieces themselves, have a mind of their own. Even thought there is a flow and a vision of what they will become, they instead, weave themselves into something completely different. These unexpected and fortuitous experiences typically turn out much better than the original plan. For a look at all the items made check out The Repurposement's Pintrest board. There are times when a complete makeover is the right course of action. Be it an object, an idea, or even a life. The act of turning into something completely different, with a new purpose is energy producing. Using items that are no longer wanted or needed and transforming them into something entirely different is miraculous. It is an mindful Earth conscious act.